Lock in a great price for Holiday Inn Express Toulouse Airport – rated 9 by recent guests! The breakfast was excellent. Our family suite was enormous and comfortable. The staff was friendly. The price was correct. We had a great stay, I would recommend this hotel to others. Parking was accessible. Very clean, staff helpful, nice room, good snack. Extremely well situated for the airport, spotlessly clean with on site secure parking. The staff were very welcoming and helpful. We will definitely be back! Highly recommended. The hotel is very new, well decorated. The parking lot is free, but locked with a gate. The family room is very large, with a terrace. The breakfast is very complete, buffet style. There's a small lounge with a fireplace and sofas, at the bar. Water boiler with free coffee or tea is available in the room. Everything about it, was very pleasing. Breakfast was sumptuous. Staff was helpful and most gracious. As my seven-year-old grandson expressed to me during our stay, "If we ever need to stay near the airport again, I think we should definitely stay here!" I absolutely agree. Great selection at breakfast. I especially liked the scrambled eggs cut up into bite-sized portions. Clean, friendly helpful employees. Great breakfast. Shuttle service to airport was timely. The room was spacious and clean, the bed was very comfortable. Comfortable beds. Great breakfast. Free shuttle to/from the airport. Fabulous breakfast selection. Stellar coffee machine. Fresh croissants and pain au chocolat! Especially appreciated was the free shuttle service from and to the airport! One of our top picks in Blagnac.Serviced by a 7/7 free airport shuttle and offering a 24-hour front desk, this Holiday Inn Express Toulouse Airport is located just 2 minutes from Toulouse Airport and a 10-minute drive from the city center. It features an outdoor heated seasonal swimming pool and a mini-gym. 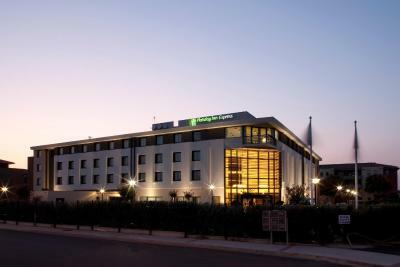 The Holiday Inn Express Toulouse Airport has air-conditioned rooms featuring triple-glazed windows, a satellite channel flat-screen TV with a large range of national and international channels, free WiFi access, a courtesy tray and a direct telephone line. The private bathroom includes a hairdryer. Guests are invited to relax in the Holiday Inn Express Toulouse Airport’s wine bar, which has a large flat-screen TV and an outdoor pool-side terrace. They can also enjoy a daily buffet breakfast which is included in the room's price. Other facilities offered at the Holiday Inn Express Toulouse Airport include a business corner with high speed internet access. The hotel provides free private and secured parking during your stay. Valet service is available for an extra fee. There is a tram stop, servicing Toulouse center, just a 5-minute walk from the property. This property is also rated for the best value in Blagnac! Guests are getting more for their money when compared to other properties in this city. When would you like to stay at Holiday Inn Express Toulouse Airport? Free Wi-Fi access and a flat-screen TV are provided in this air-conditioned room. This comfortable and spacious room can sleep up to 2 children and 2 adults . A EUR 10 charge per adult will be applied from the third and fourth adult in the room. There is no charge for children under 15. Come and discover the Hotel Holiday Inn Express Toulouse Airport*** set in a cozy neighborhood just a few steps from major aviation corporations, from a commercial center and nice restaurants. Business and Leisure travelers can unwind in our garden veranda and cool off in the heated outdoor swimming pool. The Renaissance architecture and cobbled red-brick squares of central Toulouse are just a 15 minutes bus ride away. Airplane enthusiasts can visit the Airbus visitor centre to watch the A-380 aircraft being built. House Rules Holiday Inn Express Toulouse Airport takes special requests – add in the next step! Holiday Inn Express Toulouse Airport accepts these cards and reserves the right to temporarily hold an amount prior to arrival. Please note the airport shuttle is available upon request from 05:30 to 00:00 from Monday to Sunday, including bank holidays. The pool is only heated from June to October and depending on the weather. Absolutely excellent all round! Superb breakfast included! Amazing! There were too many things to like about the hotel ranging from its location to the comfort. Great value for money. Nice room, good breakfast. Restaurants close to the hotel were both closed on a Saturday night which was dissapointing. We ended up in McDonalds. Room clean, lobby lovely and reception staff very friendly. Shuttle was prompt to and from airport. Super clean, lovely bar area with really friendly staff, comfy bedrooms and handy location for the airport. Breakfast is good too and the airport transfer works well. Have stayed twice now and think it’s great. Very very friendly and helpful staff. No food available in the evening to have something to eat! !